Everyone in the New York-metro region, especially New Jersey residents, knows how valuable our rail infrastructure is. From commuters who take NJ Transit every day to jobs in New York to visitors and travelers across our region, nearly a million people rely on NJ Transit rail and bus services every weekday. 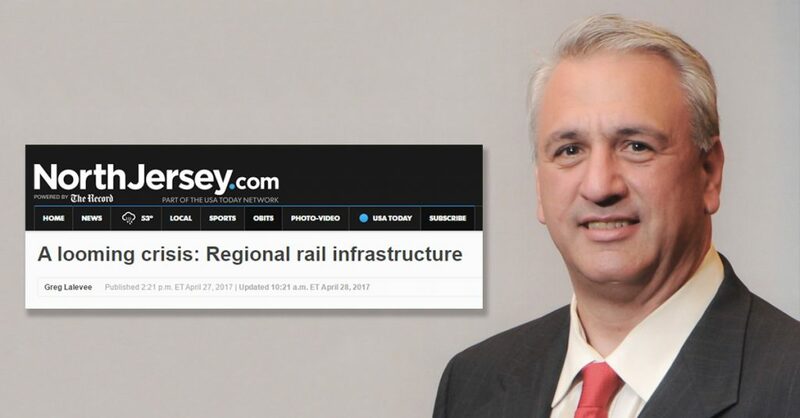 Yet a recent, recurring pattern of events has underscored the fragility of our rail infrastructure just as more and more hardworking New Jerseyans rely on it. Delays caused by outdated equipment, power problems in the Hudson River tubes and derailments in Penn Station have all turned commuting into a nightmare for our residents – and threatened the safety we expect of infrastructure in the 21st century. Nowhere is this more evident than the dire crisis facing the rail tunnel under the Hudson River. The two-tube tunnel – well over a hundred years old – is in desperate need of replacement, and with little progress on the horizon, New Jersey’s commuters are at risk. Amtrak’s own CEO has said that at least one of the tubes will need to be shut down in the next 20 years, if not significantly sooner. Doing so would cut the number of trains through the tunnel to only six per hour, decimating the flow of commuters, crippling our state’s residents who work in New York City and taxing other means of transportation even further. Trains – a highly efficient, practical and quick mode in our crowded region – need to be a larger part of our infrastructure future. The Gateway Tunnel project would go a long way towards protecting and improving New Jersey’s infrastructure. State and federal transportation regulators – not to mention much of New Jersey’s business community – have named the tunnel project the most important in the entire nation. Yet President Trump has joined a long list of seemingly short-sighted politicians in threatening to reduce or deny federal funding contributions to the project and other important rail improvements, leaving New York and New Jersey to fill a multibillion dollar hole in order to make the project a reality – something neither state can afford despite the looming crisis. Millions of riders throughout the East Coast and New Jersey – including New Jersey Transit customers and commuters on Amtrak’s bustling Northeast Corridor – would stand to gain from new, safer and more reliable Hudson River tunnels. The project would create thousands of jobs, preserve tens of thousands more from the impact of a tunnel closure and jump-start the region’s economy. And yet still, despite consistent reminders that our rail infrastructure is crumbling before our eyes, political will is weak and insufficient. Last year, New Jersey politicians found common ground on a solution to fund the Transportation Trust Fund, which will create more jobs, improve the efficiency of our roads and bridges, and make our state a better place to do business. Our leaders and residents made hard sacrifices to reach a true compromise in the best interests of our state. Now it’s time for federal, state and local officials to band together and do their part for our region’s rail infrastructure. We simply can’t afford to delay this project any longer; we needed to break ground on new Hudson River tunnels decades ago. Let’s set aside our differences and get started on a project that’s long, long overdue. Greg Lalevee is the chairman of New Jersey’s Engineers Labor-Employer Cooperative and Business Manager of the International Union of Operating Engineers (IUOE) Local 825.